﻿ Watch out for donation scams. Watch out for donation scams. If you receive an email about a charitable donation, it is probably a scam. Organisations that make big donations do not inform the receivers via email. The scammers use names of existing organisations. In most cases the email accounts in the email are free email accounts and the phone number is a mobile phone. These scams work exactly like lottery scams, where the victim is told that he won a lottery. 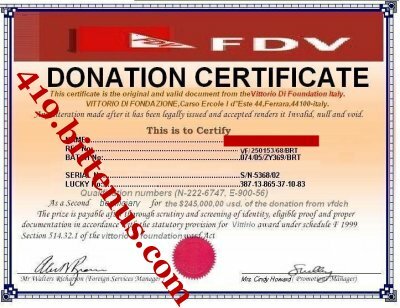 Read how my friend Emilia handled a donation letter she received from Fondation De France, or read about my friend Pandit, that too late realized that his donation from Foundazion di Vittorio was a scam.